Is There a Right Way and Wrong Way to Rake Leaves? Is There a Right and Wrong Way to Rake Leaves? Many children stuck with the chore of raking have wondered if there's really a right way and wrong way to rake leaves (after all, they argue, the wind will eventually sweep them away). When those kids grow up, buy a home, and become responsible for their own lawn care, they ponder the question all over again, albeit in a more sophisticated way. This issue is more complex than you might think, because doing the job efficiently and effectively requires preparing for it properly, executing it in a smart way, and putting the leaves to good use afterward. Having the right gear and right form can help you avoid physical problems associated with raking. 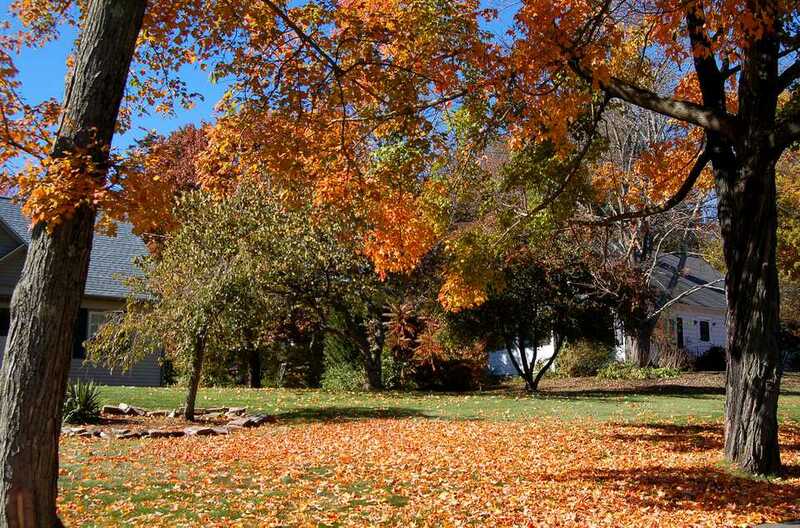 Raking leaves off the grass at the right time is critical to doing the job correctly. You can remove lawn thatch at the same time by using the proper method. Knowing some handy tricks can make the task go more smoothly. If you aren't putting the fallen leaves that you rake to good use, you're wasting money. Choose a length suited to your height. If you find that using an ergonomic snow shovel helps you avoid injury in winter, you may profit from using an ergonomic rake in fall. Rakes with cushion grips are easier on your hands. For efficiency, it's best to wait until almost all of the leaves have fallen before raking. That way, you can get all of your raking out of the way in one day. In the meantime, mow regularly with either a mulching mower or a bag attachment to get rid of most of the leaves that fall the earliest. Just don't wait too long, which can be unhealthy for your grass. But do wait until the leaves are dry and you have a wind-free day. Take your time raking, so that you don't miss any spots. Raking deeply and vigorously can cause you fatigue in your hands, arms, shoulders, and back. Because you're bearing down hard on the rake to drive the tines into the thatch layer and dislodge it, you may be using muscles that you don't use much. Be sure to take breaks and switch how you're holding your hands (so that undue pressure isn't focused on one area). Maintain good posture, with your knees bent and back straight. Let your legs do some of the work: Instead of constantly pulling leaves in with your arms, mix it up a bit sometimes by laying your rake down on some leaves and walking gently backward, dragging the leaves as you walk. While serious thatch problems cannot be resolved merely by raking, it certainly doesn't hurt to try to stay ahead of thatch by raking deeply, vigorously, and thoroughly when you do rake. The added benefit of thatch removal from raking the right way is a good argument for raking rather than using a leaf blower or vacuum. Yes, the latter is quicker, but it does nothing to alleviate harmful thatch build-up. Do you use mulch in the landscape? Do you fertilize your plants organically with compost? Do you buy garden mulch and/or compost from someone else? If you use these products and buy them from someone else, then don't bag up the leaves and put them on the curbside to have your town remove them. Instead, just drag the leaves you have raked up onto the tarp over to your compost bin or mulch container and use them for mulch and/or compost. You can turn the by-product of your fall leaf-raking efforts into homegrown mulch and/or compost, thereby saving money.